Some things, as they say, stick around like a hair in a biscuit. While that expression — though describing a reality that would be unsavory — is used to affirm laudable tenacity, occasionally it is a fair assessment of a simply ubiquitous and unceasing presence. Since serving his term in the late 70s, President Carter has hung around: refereeing world bad guys, negotiating important deals, earning Nobel prizes, building Habitat for Humanity houses. Now President Carter’s forays include an NIV study Bible that bears his name, published by Zondervan and available here. 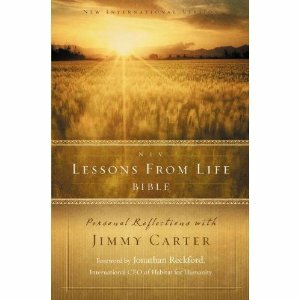 Called NIV Lessons from Life Bible: Personal Reflections with Jimmy Carter, this study Bible touts Presidents Carter’s experience as a Plains, GA Sunday School teacher, an activity that predates his term in national public office. President Carter recently sat for a Huffington Post interview (seen here) to talk about his new Bible. 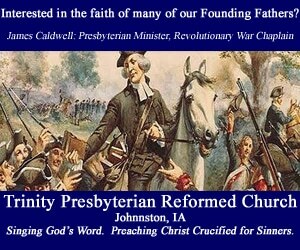 His responses should lead us to question Presidential hermeneutics and Zondervan’s discernment, as well as wonder if Jefferson wasn’t thinking of just such a situation when he told the Danbury Baptists of a “high and impregnable” wall between Presidents and biblical commentary. As revealed in the HuffPo interview, President’s Carter’s hermeneutic is suspect, to say the least. His interpretation would neglect an acknowledgement of figures of speech — including metaphor and hyperbole — as when he posits “we know that stars can’t fall on the earth.” He engages in a form of “chronological snobbery” (C.S. Lewis) to reject both young-earth theory and male leadership in the church. He employs a “red-letter hermeneutic” to permit such things as homosexual marriage because Jesus didn’t forbid it, ignoring the rest of the biblical witness on the subject. And he proposes a sort of theological smorgasbord to permit believers to decide “if and when” certain passages should apply to them. This is all consistent with President Carter’s low view of biblical authority: “God inspired the Bible but didn’t write every word in the Bible.” President Carter reveals an understanding of Scripture that is, oddly, Jeffersonian, when he denies the authority of those miraculous elements of Scripture while advocating focus on social and moral concerns. President Carter maintains that “the basic principles of the Bible are taught by God, but written down by human beings deprived of modern day knowledge. So there is some fallibility in the writings of the Bible” (emphasis added). Zondervan cannot be faulted for the business acumen displayed by publishing a Bible with a former President’s name and comments. But the publishing of Bibles and biblical materials is no mere business enterprise. That a Sunday School teacher of such tenure would still exhibit such woefully inadequate interpretation of Scritpure should have been a clue to Zondervan to pass on this project. And it should have been a clue to a former President that election to national office and receipt of a Nobel prize does not a teacher make.